A supercar is a car that is based on extremes. They feature styling, performance, power and technology that makes you say "Wow" and shake your head in amazement. Recent examples of the genre include the McLaren F1, the Ferrari F50 and the Bugatti EB110. All are mind blowing no matter how you look at them. Most things evolve. They change slowly, gradually maturing sometimes in a manner that makes it hard to pinpoint when the old went out and the new came in. That is usually true with art, music and cars. It is not true with the era of the modern supercar however. There is a well defined moment when everything changed, and that moment is the appearance of the Lamborghini Miura. The first production Lamborghini is the 350GT (right). Like the Miura, it featured a V12 engine, but the styling is probably better appreciated today than at its inception in 1964. 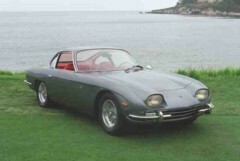 120 350GTs were produced, with a retail price of $13,900 USD. The engine was a 3.5 liter, and was later produced in 4.0 liter form as the 400GT. A 2+2 version (the 400GT 2+2) was made from 1966 to 1968. Although not spectacular, the 350GT did serve to introduce the world to the V12 engine designed by Giotto Bizzarini. While the 350GT/400GTs were produced in a corner of Mr. Lamborghini's tractor factory, the small engineering and design staff tossed around amongst themselves the idea of producing a mid-engine GT car. Note: Clicking on any photo will enable you to view a larger image.